In addition to the home improvement web design, this promotional video was created using Final Cut Pro and Motion. Original, stock video clips and animation was used to visually present the Fredrick Lee message with an effective local appeal. For more than fifteen years, Fredrick Lee has been focused on providing homeowners with innovative design, meticulous craftsmanship and high quality, personalized service. Fredrick Lee contacted us about redesigning their website and making a range of improvements to finish off the site. We discovered that the remodeling business was fierce and saturated, but through strategy, research and professional web design and functionality, we would help to realize Fredrick Lee’s fullest potential. The new home improvement web design website needed to be bold, vibrant, professional and aligned to the Fredrick Lee vision, while retaining its own unique brand identity. We designed the website by analyzing competitors and researching target markets in a way that met Fredrick Lee’s requirements. 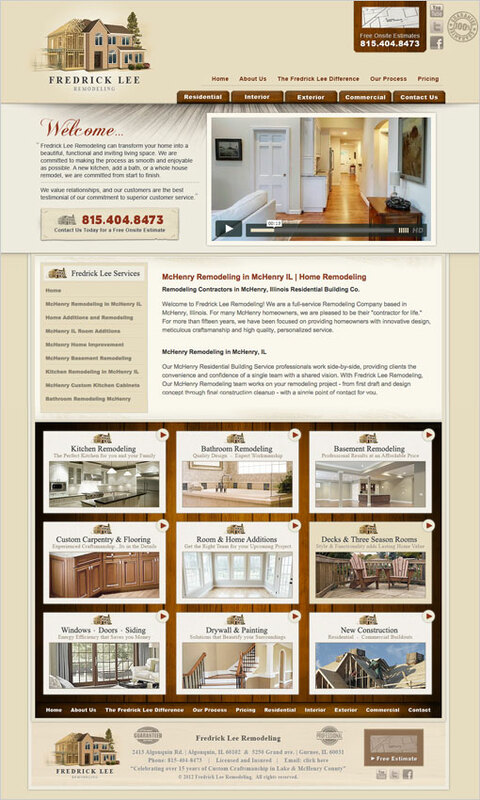 The aim of this home improvement web design project was to raise awareness of Fredrick Lee Remodeling, maximizing sales and helping to make it become a huge success.